In recent years the need for sustainable process design and alternative reaction routes to reduce industry?s impact on the environment has gained vital importance. The book begins with a general overview of new trends in designing industrial chemical processes which are environmentally friendly and economically feasible. 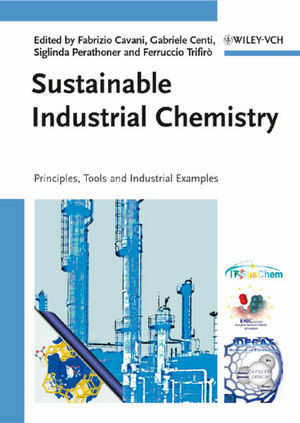 Specific examples written by experts from industry cover the possibilities of running industrial chemical processes in a sustainable manner and provide an up-to-date insight into the main concerns, e.g., the use of renewable raw materials, the use of alternative energy sources in chemical processes, the design of intrinsically safe processes, microreactor and integrated reaction/ separation technologies, process intensification, waste reduction, new catalytic routes and/or solvent and process optimization. Professor Fabrizio Cavani received his PhD in Industrial Chemistry from the University of Bologna in 1986. From 1986 to 1990 he worked at the Catalysis Centre of EniChem, where he investigated new catalysts for the oxychlorination of ethylene and for the Alkylation of benzene with propene, and gave technical assistance to the catalysts production division. In 1990 he joined the Catalytic Processes Development team at the University of Bologna becoming Associate Professor of Industrial Chemistry there in 2000. Hee is author of over 200 journal articles, 25 patents, two books on catalytic selective oxidation and one book on the development and management of chemical processes and is the editor of 4 special journal issues. he is on the board of the Italian Platform for Sustainable Chemistry. Professor Gabriele Centi is Full Professor of Industrial Chemistry at the University of Messina and a past President of the European Federation of Catalysis Societies. He is the Coordinator of the Network of Excellence IDECAT and Co-Director of the European Laboratory for Catalysis and Surface Science and President of ERIC (European Research Institute of Catalysis). His research activities lie in the development of industrial heterogeneous catalysts for the field of sustainable chemical processes, environmental protection and clean energy. He is author of over 260 journal articles, editor and/or author of 7 books, editor of 7 special issues, chairman of several International Congresses and Editor of the Wiley-VCH journal ChemSusChem. He is also a Core Team member for the European Technology Platform for Sustainable Chemistry. Professor Siglinda Perathoner is Associate Professor of Industrial Chemistry at the University of Messina. After some years experience in the field of photophysics and photochemistry of supramolecular systems, she moved to the area of catalysts. In 2001 she joined the University of Messina where her most recent research interest include nanostructured zeolites, catalytic membranes, catalysts for reactions in supercritical fluids, catalysts for waste water purification and remediation, photo(electro)catalytic conversion of carbon dioxide, and fuel cells. Her aim is the design of novel catalytic materials for sustainable processes, environment protection, and cleaner energy. She is author of over 130 publications, including 15 reviews, has been co-editor of a book and two special journal issues, and has contributed to various entries in encyclopedias. Professor Ferruccio Trifiró is Full Professor of Industrial Chemistry at the University of Bologna. Currently he is the Dean of the Faculty of Industrial Chemistry, and Director of the journal "La Chimica e L'Industria" (Chemistry and Industry). His main research activities lie in the development of heterogeneous catalysts for processes in the field of petrochemistry, environmental protection, fine chemicals and specialties production, clean energy and hydrogen production. He is a past Chairman of the World Congress of Selective Oxidation. He is author of over 300 papers in International Journals, two books on Selective Oxidation, and of 18 patents.